Active-high: This connection places +5 V on the I/O pin when the pushbutton is pressed. When the button is released, the I/O pin sees 0 V.
Active-low: This connection sees +5 V when the pushbutton is not pressed. When you press the pushbutton, the +5 V is removed, and the I/O pin sees no voltage. In the active-high circuit, the I/O pin is connected to ground through R1 and R2 when the pushbutton isn’t pressed. Thus, the voltage at the I/O pin is 0. When the pushbutton is pressed, the I/O pin is connected to Vdd (+5 V) through R1, causing the I/O pin to see +5 V. As a result, the I/O pin is LOW when the button isn’t pressed and HIGH when the button is pressed. In the active-low circuit, the I/O pin is connected to Vdd (+5 V) through R1 and R2, causing the I/O pin to go HIGH. But when the button is pressed, the current from Vdd is shorted to ground through R2, causing the voltage at the I/O pin to drop to zero. Thus, the I/O pin is HIGH when the button isn’t pressed and LOW when the button is pressed. Note that in both circuits, R1 is connected directly to the I/O pin to prevent excessive current flow when the switch is pressed. Without this resistor, the pin would be connected directly to Vdd (+5 V) or Vss (ground) when the button is pressed, which could damage the BASIC Stamp. In an active-high circuit, R2 is called a pull-down resistor because it pulls the current from the I/O pin down to zero when the pushbutton isn’t depressed. 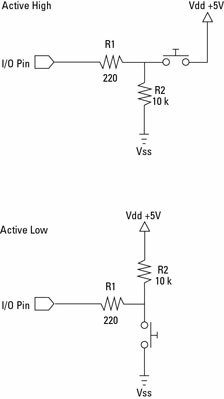 In an active-low circuit, R2 is called a pull-up resistor because it pulls the voltage at the I/O pin up to Vdd (+5 V) when the pushbutton isn’t depressed.